In a response symbolic of a problem de Blasio is facing as he heads into his re-election year, Lumumba Bandele tweeted his response to de Blasio: “You & #NYPD are in no position to talk about respect & compassion.” Bandele then cited the fact that the police officers who killed Ramarley Graham, an unarmed black teenager shot to death in 2012, and “others,” likely a reference including Eric Garner, are still employed by the city. Bandele identifies himself on Twitter as an organizer, writer, producer, and professor from Bedford-Stuyvesant. His mention of Ramarley Graham came as there has been increased attention from police reform activists to pressure de Blasio to proceed with an NYPD trial for Officer Richard Haste and the others involved in Graham’s death. NYPD Commissioner James O’Neill recently announced that such a trial was likely to begin in early 2017. The new year, de Blasio’s fourth as mayor, is also expected to see movement regarding accountability for Officer Daniel Pantaleo, whose chokehold led to Garner’s 2014 death during an attempted arrest. A Staten Island grand jury declined to indict Pantaleo in 2014, and the federal Department of Justice has been investigating his actions, which, according to de Blasio and the NYPD, has kept the city from moving ahead with any of its own disciplinary procedure. As the mayor kicks off his re-election campaign, police reform activists, including some elected officials, are frustrated with de Blasio for what they see as a failure to live up to his 2013 promise as a police reformer, especially with regard to increasing accountability at the NYPD. While these two high-profile cases may soon see developments, advocates say that punishment for officers takes far too long and is far too soft, and that on holding officers accountable for inappropriate or illegal behavior, the mayor has done nothing systemic to change NYPD culture. For his part, de Blasio argues that he has been the reformer he said he would be, that he has overseen major changes to policing in New York City while both crime and arrests have declined. De Blasio, a Democrat, has been battling perceptions that he is "anti-cop" and would be soft on crime since his 2013 campaign. While he has mostly assuaged the latter, the former persists in some corners, perhaps contibuting to a lack of action in addressing accountabiity, even as, on the other side of the equation, reformers believe he has not been tough enough on badly-behaving officers. Some reform advocates do give de Blasio credit for following through on elements of his campaign rhetoric, which had a significant focus on policing as part of his larger call for greater equity. But, they are quick to note that de Blasio’s efforts have not extended into essential areas of transparency and accountability. City Council Member Jumaane Williams and members of Communities United for Police Reform, for example, acknowledge that de Blasio has overseen certain tactical changes at the NYPD, like instituting a new training regime focused on de-escalation, continuing to reduce street stops, and a more lenient approach to marijuana arrests. But, they believe that it amounts to little if it is not accompanied by major changes to how police officers are dealt with when they abuse their power, especially around excessive use of force. Real culture change, they say, requires both front- and back-end reform -- new training, strategies, and directives, as well as beefed up oversight and increased transparency and accountability. At the same time de Blasio has been criticized for doing little on officer accountability, after decades of doing so the NYPD stopped making public a weekly update on officer disciplinary actions, citing their realization that they had been violating a state law. When de Blasio and NYPD Commissioner James O’Neill held an early December press conference to announce low crime in the city, Communities United put out a press release saying, “As Mayor de Blasio and Commissioner O’Neill gave briefing on crime data from November, they continued to ignore alleged abuses and misconduct during month.” The release linked to more than two dozen news articles about alleged police abuses or a lack of transparency into the NYPD. CPR and a majority of City Council members want to see the Right to Know Act passed. The legislation would require police officers to provide more information to people they are stopping on the street, including identification. Despite majority support, the Right to Know Act has stalled in the City Council because de Blasio does not support it, Council Speaker Melissa Mark-Viverito has not allowed it to come to a vote, and other Council members have been unwilling to move it to a vote without the speaker’s blessing. Mark-Viverito did announce a compromise with the NYPD to institute elements of the legislation through NYPD training and the patrol guide. Council Member Williams is one sponsor of the Right to Know Act, and while he wants to see more from de Blasio and the NYPD, he also says that there has been progress. In an interview, Williams said that there probably hasn’t been enough credit given to de Blasio for some of the change, but that that is a result of other failings. “It’s very real that when it comes to transparency and accountability we’re no better than any other city in this nation and that’s a problem, we should be leading this effort,” Williams said. Williams said he’s pleased about neighborhood policing, street stops continuing to decrease, and marijuana arrests being down, but that the city still needs to look at the racial breakdown, the percentages by demographic group, of some of the stops and arrest data. It is a sentiment echoed by leaders from Communities United for Police Reform, an umbrella group, as well as PROP, the Police Reform Organizing Project, which monitors arrest data and court proceedings. These activists say that it is good that a number of metrics are trending downward overall, but that disproportionate racial disparities persist on everything from street stops to summonses and arrests for all types of low-level crimes. “I would love to hear a coherent answer on that,” Williams said when asked why he thinks de Blasio hasn’t been more aggressive on the transparency and accountability aspects of police reform. Asked recently about the issue, de Blasio told WNYC radio host Brian Lehrer that he believes he’s lived up to his promises on policing and that disciplinary matters are done on a case-by-case basis. “What did I say we were going to do? We were going to greatly decrease the use of stop-and-frisk. We did that. We were going to institute neighborhood policing. We’re doing that. We were going to stop the things that were causing a rift between police and community. For example, we stopped the arrest for low-level marijuana possession. You know, we are now doing an entirely different training regimen for our cops including de-escalation when there are encounters with civilians. We’re starting implicit bias training at the NYPD – a huge step forward for the largest police department in the country,” de Blasio said December 7 on WNYC. 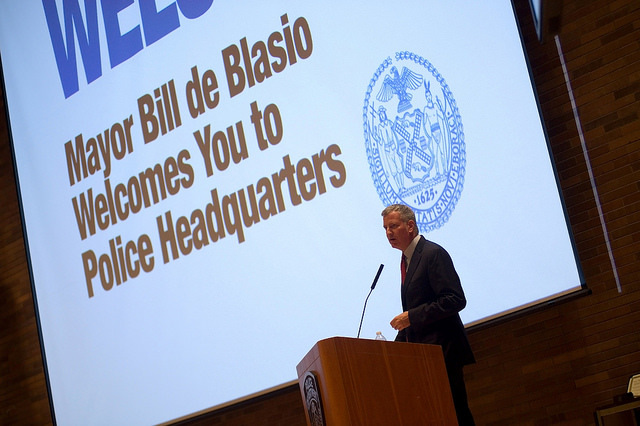 To support his point, de Blasio said that the city has “reinvigorated” the Civilian Complaint Review Board, a nominally independent agency that hears civilian complaints about the NYPD, holds hearings, and recommends punishments. Under de Blasio, complaints against police officers to the CCRB have dropped, something the mayor regularly cites. He mentioned it on WNYC earlier this month, while also bringing up the NYPD Inspector General, a position created through City Council legislation co-sponsored by Council Members Williams and Brad Lander, de Blasio’s successor in the City Council from Park Slope, and passed over the veto of then-Mayor Michael Bloomberg (de Blasio was supportive of the legislation as public advocate at the time). One problem that reformers point to in de Blasio’s argument is that the NYPD commissioner continues to possess discretion as to what extent he or she follows CCRB recommendations on officer punishment and that discretion almost always leads to a lesser penalty, often significantly so. Officers who use excessive force, for example, may be docked a few vacation days as opposed to being suspended without pay or worse. Advocates want “zero tolerance” for officers who violate the rights of civilians. De Blasio, who has had a contentious relationship with the main union representing rank-and-file NYPD officers, has repeatedly deflected discussion of police accountability by focusing on the new training that officers are getting, arguing that it and other reforms are preventing bad actions by officers, and reducing negative interactions between officers and members of the public. A spokesperson for de Blasio argued that “The mayor has delivered the farthest reaching criminal justice reforms of any mayor in the city’s history," but did not address questions around officer accountability and punishment for officers who violate rules and laws. The de Blasio administration is currently being sued by Legal Aid Society and others over its refusal to release the discipline records of Officer Pantaleo, whose chokehold led to Eric Garner’s death. This, in combination with the change in policy around what had been a weekly posting of officer promotions and disciplinary action at NYPD headquarters has led to claims of backsliding on transparency and accountability. Pantaleo has been on modified duty since Garner’s death, but he continues to draw his NYPD salary, and was even found to be collecting significant overtime pay -- something that the NYPD quickly moved to address when Politico New York reported it. Overtime limits or not, modified duty is not enough for Pantaleo or other officers accused of wrongdoing, advocates for reform say. It’s unclear at this point what “the pack” will look like as the mayor seeks re-election in 2017, but Bandele said “I don’t know” when asked if de Blasio has done enough good to warrant her support this time around. She indicated there’s still time for him to show real commitment to police reform by focusing on the transparency and accountability elements. Note: Monifa and Lumumba Bandele are married. Separately, this reporter noticed the Lumumba Bandele tweet mentioned in the beginning of the story and came across Monifa Bandele at the press conference mentioned, later confirming the relationship.